Daring Cooks: Sorry DCs! Just like the last DB challenge, I was unable to squeeze this one into my schedule. Hope to be back in business next month. H’okay! Now we are all set. I got my new lens in the mail on Friday and this morning the filter arrived. “The circle upgrade is now complete. When I left you, I was but the learner; now I am the master.” I feel a little giddy holding this thing in my hands. Fall is here, kids. We had a big cool down on Saturday replete with cold, damp fog, rain, and a minor frost overnight. 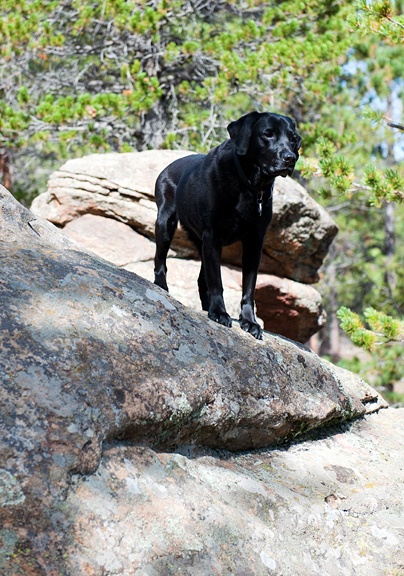 It has warmed back up a little, but the mood is settling in quickly – that desire to throw on a snuggy, soft fleece. When I close my eyes, I can feel the warmth radiating from the oven, see apples in the golden autumn light, and smell cinnamon on the air. We took Kaweah for a quick walk yesterday and encountered a mother moose and her baby (which is as big as a Honda Civic) racing across the trail and disappearing into the woods. They’re really quiet. Jeremy didn’t even hear them, he only looked up when I stopped and said, “Moose!” Kaweah didn’t notice a thing (too busy sniffing for deer poop). Today is Jeremy’s birthday, which he actually missed – literally. That’s because he was flying over the International Date Line last night and jumped a day ahead to the 15th. I joked that this might be the fountain of youth… but if you’ve ever flown coach from the US to Sydney it’s more like the fountain o’ misery. So happy birthday, Jeremy! We’ll have a proper celebration when things settle down. For now, we’ll settle for a tiny celebration of sorts. I don’t know about you, but shrimp is always a festive ingredient for me. Maybe because it’s expensive (granted, I typically buy fresh, wild-caught shrimp), but I think it has more to do with how happy shrimp looks. It’s what I consider decorative with its curly, pink and white flesh. A perfect morsel to pop in your mouth. This is among the simpler Chinese-style shrimp dishes I enjoy at home. 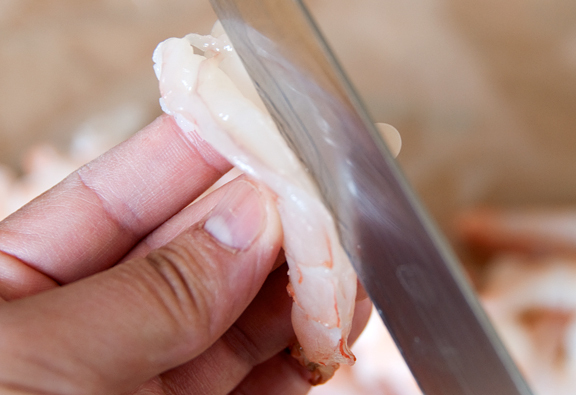 Aside from peeling and de-veining the shrimp (which you can avoid if you purchase them shelled and de-veined) the preparation and cooking time are less than 20 minutes. The other thing about this stir fry is that it is totally flexible. You can add all manner of ingredients. 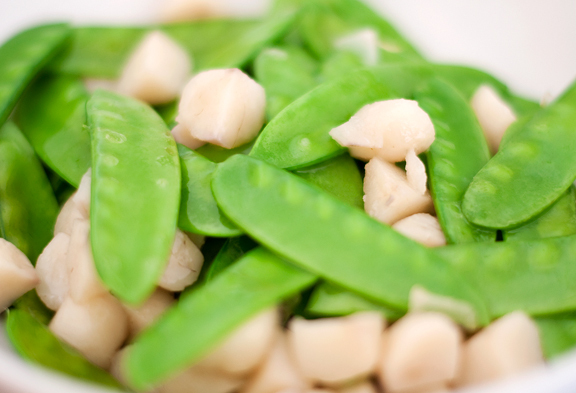 My favorites: snow peas and water chestnuts. But maybe you like bamboo shoots, chinese black mushrooms, baby corn, straw mushrooms, carrots, red bell peppers, peas. Totally up to you. I give my vegetables a quick sauté in a little oil and salt first (especially for the vegetables that take longer to cook like carrots or peppers because you really don’t want to overcook shrimp). When they are *almost* cooked through, I remove them to a bowl. After I heat up a little more oil with the green onions and garlic, I will stir-fry the shrimp until they are just underdone. At this point, I add the vegetables into the pan and give a quick stir for a minute before pouring it onto a plate to serve. 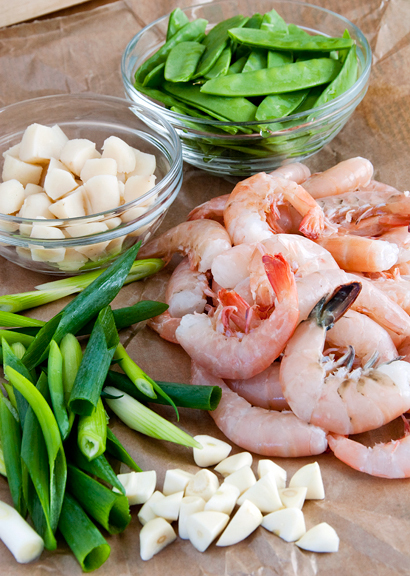 Just remember that overcooking shrimp and snow peas is a crime, punishable by law. 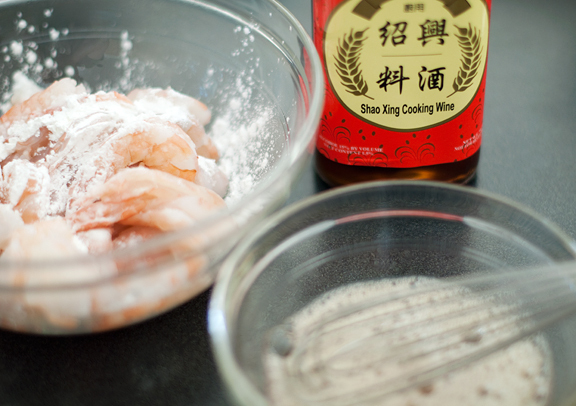 In a medium bowl, mix the shrimp, cornstarch, salt, and shao xing together until the shrimp is evenly coated. Heat a tablespoon of oil in a large pan on high heat. Sauté the vegetables (snow peas and water chestnuts) until they are just cooked (still undercooked). Season with a sprinkle of salt. Remove from heat and set the vegetables aside in a bowl. Add another tablespoon or two to the pan and toss in the green onions and garlic. When the oil begins to sizzle, stir the garlic and onions around and add the shrimp. Stir-fry the shrimp until they are just underdone (about 3 minutes) and add the cooked vegetables to the pan. Stir the shrimp and vegetables together for another minute until cooked and serve hot. and Happy Birthday to Jeremy! Wow, I’m awfully jealous ;-p! That lense is terrific! Your shots amaze me as usual and that dish makes my tastebuds tingle! The shrimp look delicious and Kaweah always has the shiniest coat….Happy Birthday to Jeremy! This looks so good! I love the mix of veggies and the shrimp. Is it bad that I’m drooling over the camera a bit more than the food??? LOL Don’t get me wrong the food looks amazing! Happy Birthday to Jeremy! Coach to Sydney? OUCH. Poor dude must feel a thousand years old today. I agree–shrimp are just little happy party guys, you know? lol…over cooking shrimp and snowpea is a crime…you are soo funny. i love it!! Love this recipe. And since I finally got my hot little hands on some Xiao Xing wine (no thanks to my usual mecca), I am ready to rumble. Snow peas and water chestnuts are favorites around here, and we buy American wild-caught shrimp because where I grew up you actually knew the guys who caught it. Can’t go buy some imported thing and look them in the eye. Yum, yum, yum. Must go plan my shopping now. I have camera envy, which is totally unwarranted. Fanciness of camera is not going to correlate to good photos for me – I’ll stick with what I know (sort of) :) Happy Birthday to Jeremy! 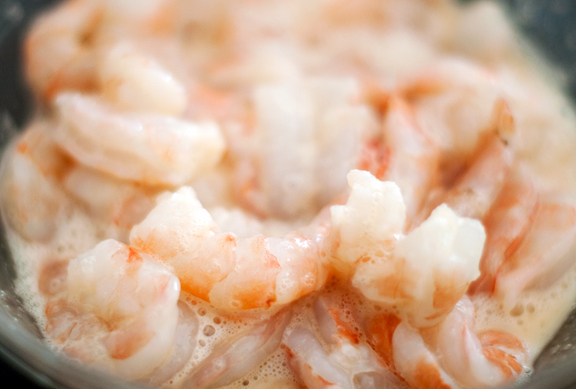 And I agree – overcooking shrimp should be punishable by law. And the more goodies in the stir fry, the better! Yummy! Happy birthday to Jeremy! Nice, is that a 24-70mm 2.8? 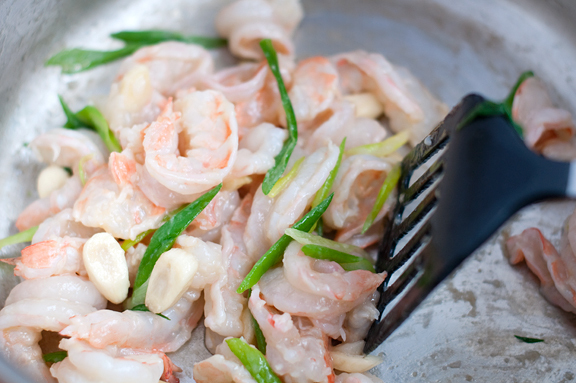 I love the “crunchy” texture that shrimp marinated in salt and cornstarch yet. Bookmarked! I knew I could come to you for great simple Chinese recipes! My mum would give me really handwavy measurements if I ask! Thanks Jen! I love shrimps!! Looks amazing (the lens and the shrimp!) I’ve been trying to do more stir-frying lately, but now my wok has gone out of commission. Dumb. Anyway, beautiful photos and great recipe! how can you tease me like like– and not name the lens in specifics? I see 700mm– and it is a nikon VR? but tell me why it is the holy grail? whatt will this lens allow you to do? I only have 2 lenses and I am itchin to get another…. oops– 70 mm not 700mm! Maybe I’m one of your “well-intentioned but not too bright” commenters, but when you say your dad does a deep fry of the shrimp with the egg white, do you mean he fries them in a lot of oil? That’s what deep frying is, but it’s not what stir frying is, as I’m sure you know. I’ll never forget the day I got my full frame Nikon DSLR, congratulations! 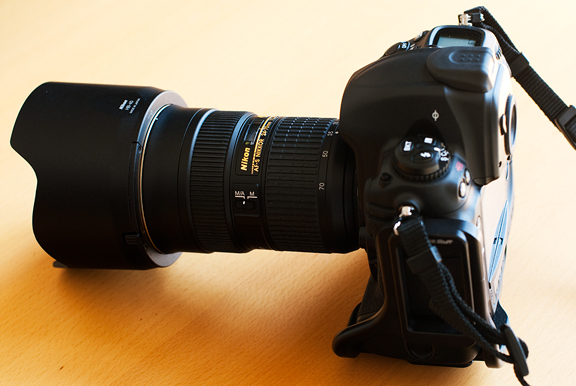 This is a great lens (24-70mm Nikon) and I love my 105mm Micro too – you might even like it for food photography! But my absolute favorite lens so far is the 24PC-E for landscape work. Enjoy your new camera! That looks really good!! It’s shrimp season here soon! Bill goes to the dock everynight to get dinner when it is. Very fortunate in that regard. Ah, The Precious… I don’t have to tell you how rocking it is. Ok, I was going to add something smart and funny, as usual – because I am so well intentioned but not bright – geez people). I was hoping you caught a photo of the Moose! When we we to Jackson Hole last year, we came home with some great photos of a Bull Moose with Mt. Moran in the background. Unfortunately, we didn’t have anything like your incredible camera and lens, or your masterful photography skills! Your Shrimp Stir Fry looks light and delicious. Happy Birthday to Jeremy. 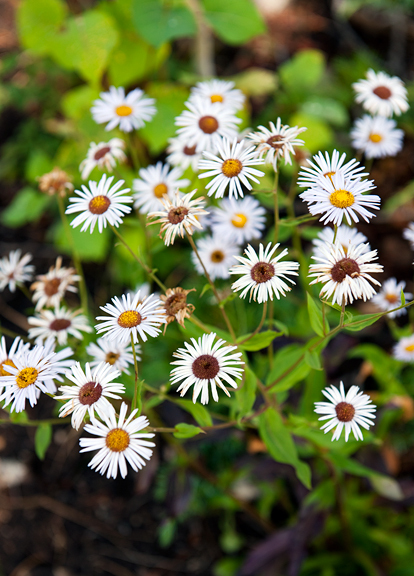 Drooling over your camera and lens…. Thanks for the birthday wishes to Jeremy :) That’s very sweet of you all! Sally – it’s the 24-70mm 2.8 and it is considered one of three of the top lenses pros keep in their arsenal. It allows for a wide range of wide angles when I’m shooting in the field and has excellent optics for the large printing I do. Karly – did you actually READ the entire discussion or did you just take that one tweet out of context? Because we were discussing people who leave insulting or hate-filled comments on our blogs and I was referring to that subgroup (which I clarified in a following tweet, but apparently you didn’t read that). My dad does a quick blanch in hot oil first to set the egg white and then removes the shrimp and stir-fries it like normal. This looks so fresh and lovely! And, I have lens envy. I just bought the 18-270 for canons. Is there a reason it is better to buy lots of small range lenses instead of an all in one? Thanks…I really love your pictures:)! That lens makes me kinda cry a little. Also, happy birthday to Jeremy! He deserves a wonderful one after that long in coach. It should be considered inhumane to require someone to travel that far in economy class. No, sorry, i didn’t READ the whole discussion. I scan tweets. I’m not big into twitter, sorry. Maybe I should devote more time to it. Didn’t realize it was such a valuable source of information. You do realize I have to hate you now….major camera envy. Your shrimps look absolutely gorgeous and delicious too! ouuuu, camera envy!!! big time – just dropped my D90 and have to send it in, bummer. Just finished shrimp with snow peas… what a treat. I prepared it as a reward for making it through a challenging meeting… so glad I made it… the shrimp and the meeting. 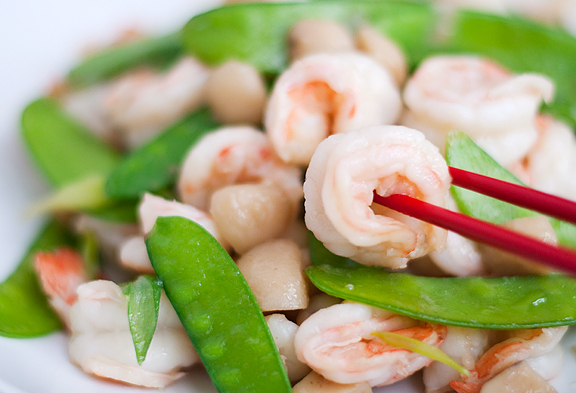 Love shrimp & snow peas. Yours looks perfect. i have new lens envy jen! and happy bday to jeremy! Hey saw your talk on indianfoodrocks, woohoo! It was awesome. so THATS why you were so mysteriously needing a hot male model for food, pahahaha. Saw your video at IFC and glad to know I am not a total loser ’cause I use a point and shoot digital camera instead of the fancy SLR. Won’t nag T for one now. Loved the presentation and love your blog. You are one brave and funny lady. Just watched the video at Indianfoodrocks & you’re awesome “in person” too! you’re a sucky photographer with a dSLR…ha! Thanks Jen, you’ve just saved me a ton of money! Now I’ve just got to work on balance….I’ll admit that I need to develop some patience if I want to move my photography up a level. Hard to make myself believe I might need to LEARN lighting, that it won’t just come to me. Melanie – it really has to do with the quality of the glass. I have the 18-200mm which is a great range, but the quality of the optics is moderate and the lens is only good on DX (cropped frame). I just made this. I’m not sure if I did it right, but it still tastes good! Do you know where I can purchase Shao Xing wine? I cannot find it anywhere and I even live in San Francisco!! Suggestions?!? Zack – in SF you should just walk into any Asian grocer and ask for Shao Xing cooking wine (sometimes called cooking sherry). Just about all of them have it.